The trafﬁc phys­i­cal space is par­ti­tioned into areas called zones which are man­aged by spe­cial­ized agents called zone man­agers. 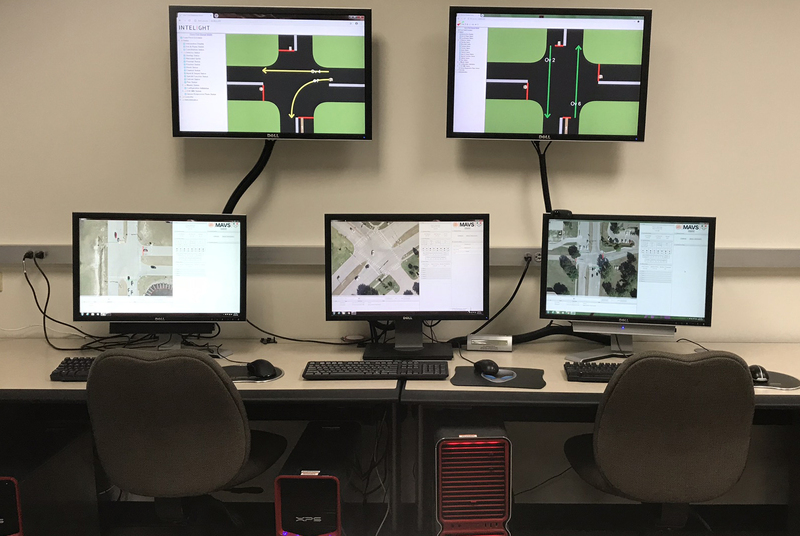 A zone man­ag­er is respon­si­ble for a) gath­er­ing and ana­lyz­ing trafﬁc data from its zone and extract­ing use­ful trafﬁc infor­ma­tion, b) inform­ing vehi­cle and trafﬁc devices of the cur­rent trafﬁc con­di­tion, c) noti­fy­ing oth­er man­agers of changes that may affect their zones, and d) iden­ti­fy­ing appro­pri­ate glob­al trafﬁc man­age­ment strate­gies to ensure that micro-lev­el behav­iors and inter­ac­tions are con­sis­tent with the glob­al sys­tem behav­ior. 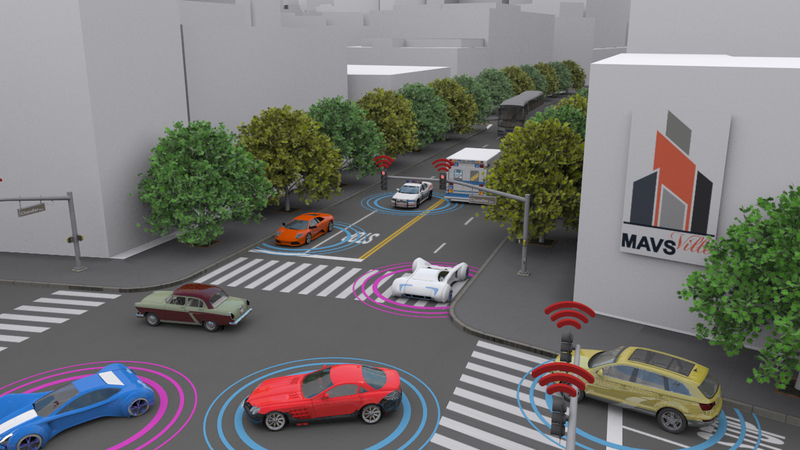 Con­text-Aware Intel­li­gent (CAI) vehi­cles are equipped with agent-based sys­tems and sen­sors that allow them to a) mon­i­tor the driver’s behav­ior, b) com­mu­ni­cate with oth­er vehi­cles, c) com­mu­ni­cate with smart trafﬁc con­trol devices, and 4) inter­act with zone man­agers to obtain trafﬁc infor­ma­tion and guid­ance in real time. Nov­el dig­i­tal trafﬁc devices con­trolled by a trafﬁc con­trol agent which deter­mines the trafﬁc sign to be dis­played based on trafﬁc con­di­tions. Through the devel­op­ment of advanced traf­fic man­age­ment algo­rithms for var­i­ous con­fig­u­ra­tions of ATS, our research has shown that decen­tral­ized, coor­di­nat­ed solu­tions improve on the state-or-the-art tech­nolo­gies for traf­fic reduc­tion and urban evac­u­a­tions. DALI (Dis­trib­uted, Agent-based traf­fic LIghts), is a smart col­lab­o­ra­tive traf­fic sig­nal tim­ing sys­tem. With DALI, inter­sec­tion con­troller agents com­mu­ni­cate with each oth­er through direct links and do not have a super­vis­ing unit to over­see coor­di­na­tion. By default, they exe­cute a tim­ing strat­e­gy that improves traf­fic flow. At the same time, they observe and ana­lyze their respec­tive inter­sec­tions. If, at any giv­en time, an agent deter­mines that its inter­sec­tion is con­gest­ed, it delib­er­ates and defines a new tim­ing plan. It also deter­mines which direct inter­sec­tions may be affect­ed by the new tim­ing plan and com­mu­ni­cates with the con­cerned inter­sec­tion agents. They in turn com­mu­ni­cate with those agents that may be affect­ed, and the process con­tin­ues until all affect­ed inter­sec­tions are noti­fied. The agents then nego­ti­ate and col­lab­o­rate with one anoth­er to ensure that the traf­fic flow will be opti­mized through­out the inter­sec­tions. DALI was val­i­dat­ed by traf­fic engi­neers as well as through exten­sive sim­u­la­tion of the City of Richardson’s traf­fic net­work. In addi­tion, hybrid sim­u­la­tions (i.e., inte­gra­tion of con­trollers in the field with the sim­u­la­tor) were run to ver­i­fy com­pli­ance with the strict traf­fic reg­u­la­tions. DALI was deployed in a Richard­son, Texas, cor­ri­dor that includes three major inter­sec­tions. 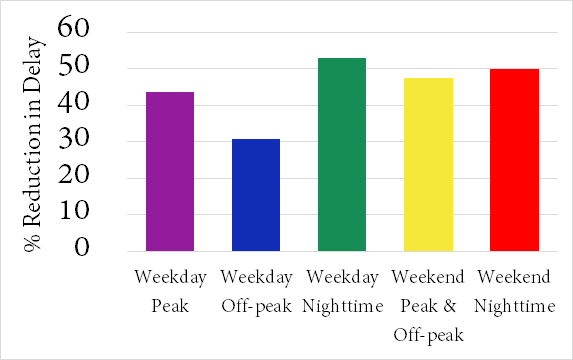 The data col­lect­ed for a peri­od of three weeks shows that in aver­age, DALI reduced delay by 40.12 per­cent (43.56 per­cent dur­ing week­day peak hours). Behnam Tora­bi, Rym Z. Wenkstern, and Robert Say­lor. A Self-Adap­tive Col­lab­o­ra­tive Mul­ti-Agent based Traf­fic Sig­nal Tim­ing Sys­tem. In Pro­ceed­ings of the 4th IEEE Inter­na­tion­al Smart Cities Con­fer­ence, ISC2 2018, Kansas City, Mis­souri, USA, Sep­tem­ber 2018. Behnam Tora­bi, Rym Z. Wenkstern, and Robert Say­lor. A Col­lab­o­ra­tive Agent-Based Traf­fic Sig­nal Sys­tem For High­ly Dynam­ic Traf­fic Con­di­tions. In Pro­ceed­ings of the 21st IEEE Inter­na­tion­al Con­fer­ence on Intel­li­gent Trans­porta­tion Sys­tems, IEEE ITSC 2018, Maui, Hawaii, USA, Novem­ber 2018. Behnam Tora­bi, Rym Z. Wenkstern, and Robert Say­lor. A Mul­ti-Hop Agent-Based Traf­fic Sig­nal Tim­ing Sys­tem for the City of Richard­son. In Pro­ceed­ings of the 16th Inter­na­tion­al Con­fer­ence on Autonomous Agent and Mul­ti­a­gent Sys­tems, AAMAS 2018, page 2094–2096, Stock­holm, Swe­den, July 2018. Behnam Tora­bi, Rym Z. Wenkstern, and Robert Say­lor. Agent-based decen­tral­ized traf­fic sig­nal tim­ing. In Pro­ceed­ings of the 21st Inter­na­tion­al Sym­po­sium on Dis­trib­uted Sim­u­la­tion and Real Time Appli­ca­tions, DS-RT 17, page 123–126, Rome, Italy, Octo­ber 2017. Moham­mad Al-Zinati and Rym Wenkstern. Sim­u­la­tion of traf­fic net­work re-orga­ni­za­tion oper­a­tions. In Pro­ceed­ings of the 20th IEEE/ACM Inter­na­tion­al Sym­po­sium on Dis­trib­uted Sim­u­la­tion and Real Time Appli­ca­tions, DS-RT 16, pages 178–186, Sep­tem­ber 2016. Moham­mad Al-Zinati and Rym Wenkstern. Matisse 2.0: a large-scale mul­ti-agent sim­u­la­tion sys­tem for agent-based its. In Pro­ceed­ings of the 2015 ieee/wiciacm inter­na­tion­al con­fer­ence on intel­li­gent agent tech­nol­o­gy, lAT’ 15, pages 328–335, Decem­ber 2015. Moham­mad Al-Zinati and Rym Wenkstern. A self-orga­niz­ing vir­tu­al envi­ron­ment for agent-based sim­u­la­tions. In Pro­ceed­ings of the 2015 inter­na­tion­al con­fer­ence on autonomous agents and mul­ti­a­gent sys­tems, AAMAS ’15, pages 1031–1039, May 2015.